With our integrated shopping cart and online partnerships, now you have the power to order from thousands of restaurants, including some of the best- straight from your phone! Whether you’re in the mood for Thai, Mexican, Vegetarian, or just looking for something to satisfy your late-night munchies, OPER has your back! Browse menus from over tons of your favorite restaurants and order with the touch of a button. OPER lets you view restaurant menus, hours, locations and special offers. Ordering food has never been so easy – just browse, order, and pay! Not sure what you want for dinner? Looking for a new place to try? No problem! Browse OPER as wide variety of restaurants including a wide variety of cuisines sure to satisfy. In a rush and want to grab something close by? OPER shows you the closest participating restaurant from your current location. 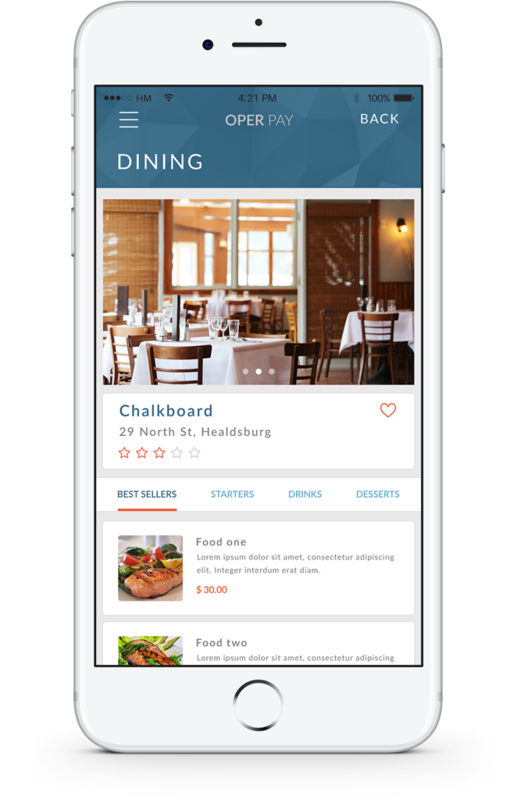 With OPER, you can see exclusive coupons and deals offered by your favorite restaurants. Take these savings and combine them with OPER rewards and you, my friend, have got yourself a win-win OPERtunity!